I was perusing the backlogs of the ecology blog Oikos, when I ran into this post on how to cite blogs. As we pride ourselves here at Replicated Typo on bring changers-of-the-field, movers of literary mountains, sifters through the dregs of boring research, and general key-holders and gatekeepers to evolutionary linguistics and cultural science (arguably justifiable or not) – I figured I should probably put links as to how to cite us here, too. 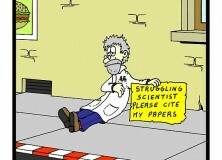 So, here’s a good link at PLoS about how to cite blogs. – in BibTeX, MLA, Chicago, and APA styles. That’s most of what you’ll probably need. So, go ahead and get citing. Full disclosure: I am a struggling academic, and would like more citations. That may or may not have influenced the writing of this post. Thanks for this – it’s going into my talk about academic blogging! Previous Previous post: How would you convince an undergraduate to start blogging?